Little is known about the efficacy and safety of combination targeted therapy for inflammatory bowel diseases (IBD), despite their use in treatment of other immune-mediated disorders. In a review article in the September issue of Clinical Gastroenterology and Hepatology, Robert P. Hirten et al discuss findings from studies of biologic agent combinations for treatment of IBD and other diseases. There are some safety concerns, based on the drug used and the disease treated. Combinations of biologic agents for different diseases and their mechanisms. APC, antigen-presenting cell; BCMA, B-cell maturation antigen; BLyS, B-lymphocyte stimulator; FcγR, Fc receptors for IgG; ICAM-1, intercellular adhesion molecule-1; IL, interleukin; ILC, innate lymphoid cells; NK, natural killer T cell; TACI, transmembrane activator and calcium modulator and cyclophilin ligand injector; Th, T-helper cell. Most studies of combination therapies for Crohn’s disease (CD) or ulcerative colitis (UC) included biologics and immunomodulators. Hirten et al systematically review results from studies of combined biologics for treatment of different inflammation-associated diseases. These might inform gastroenterologists about efficacy and safety concerns with such combinations (see figure). Hirten et al present findings from published studies of combination therapies for IBD. Although these studies did not find differences in treatment-related adverse events or infections between the combination and placebo groups, there was also also no difference in improvement of CD symptoms between groups. A trial (NCT02764762) of the combined effects of vedolizumab, adalimumab, and an immunomodulator (oral methotrexate) is underway in patients with CD. The results should provide insights into the saftey and efficacy of this approach. Combinations of biologic agents (tumor necrosis factor [TNF] antagonists and ustekinumab) have been tested in patients with psoriasis and associated joint manifestations. Although evidence comes from only case reports and a small case series, these studies raised safety concerns that must be evaluated before this combination can be considered for treatment of IBD. Most of what we have learned about the effects of combining biologic agents comes from studies of rheumatologic disorders, such as rheumatoid arthritis or juvenile idiopathic arthritis. In these patients, several drug combinations have increased efficacy compared with biologic monotherapy. TNF antagonists are effective in treatment of rheumatologic diseases and, as for IBD, frequently serve as a cornerstone of therapy. The authors conclude that although combination biologic therapy might sound attractive for patients with IBD, there have been few studies of the safety and effects. Findings from studies of other immune-mediated inflammatory disorders indicate that caution is needed—especially when one agent is a TNF antagonist. 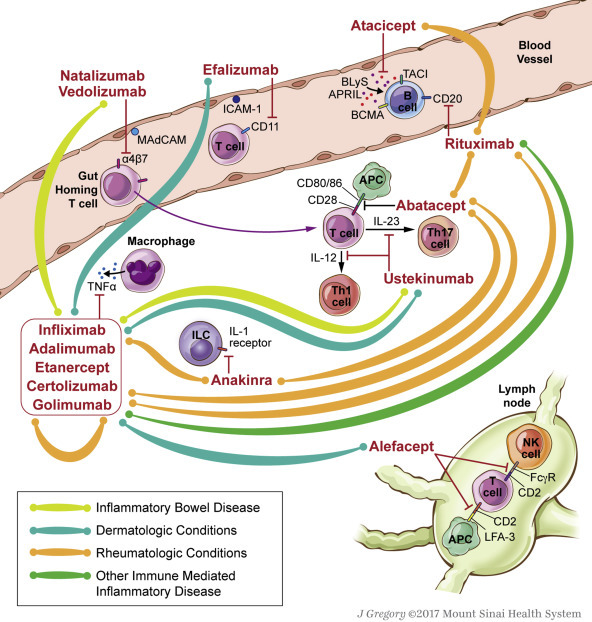 However, unlike other autoinflammatory disorders, IBD can be treated with effective and safe gut-specific anti-integrin therapies, which might be included in drug combinations. Hirten et al state that randomized trials of patients with IBD are needed to determine the comparative efficacy and safety endpoints of combination therapies. Cost effectiveness must also be considered.